This mini tray - Labs on Moor by Country Matters is made from plastic and has two raised handles on either side and a 1.5cm raised edge. Perfect for serving a cup of tea or using as a trinket tray. 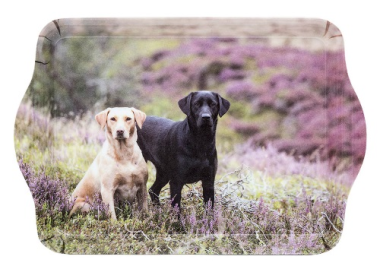 An ideal gift for labrador lovers. Ideal for a cup of tea and a biscuit or for on a bedroom cabinet as a tidy for storing loose change etc. Dishwasher friendly (top rack only) this tray measures 21.5cm x14.5cm.